Flemming Rose is a marked man. To his liberal-left detractors, he is a bigoted Islamophobe, stirring up racial and religious hatred against an already embattled minority. To his defenders, he is a brave and unflinching advocate of Enlightenment values. To his jihadist persecutors, he is a blaspheming infidel fit for slaughter. With all that symbolic baggage freighted to him, it’s easy to forget that Rose is actually a living, breathing human being, whose interior world can no more be reduced to an abstract noun than a person’s life story can be written on a postcard. Rose, as well as being a father, husband, and grandfather, is a journalist and editor—or at least he was until earlier this year, on January 1 to be precise, when he vacated his position as the foreign-affairs editor of the Danish newspaper Jyllands-Posten. I met up with him over two days in December in Copenhagen, where I interviewed him shortly before his departure from the paper and around the tenth anniversary of the affair that had brought him international renown: the publication of a series of cartoons depicting the Prophet Muhammad. We had first met two months earlier at a free-speech conference at Wellesley College in Boston, and Rose was keen to return to the themes that had dominated our discussions there: the relationship between words and deeds, the role of ridicule and humor in free societies, the centrality of free speech to democratic life, trigger warnings, safe spaces, and the infantilization of American students. He aired some of his concerns as we sat down in a coffee shop, flanked by his three bodyguards, whose presence, though unobtrusive, couldn’t be ignored, not least because one bore a striking resemblance to a youthful Dolph Lundgren and because all three were seriously packing. “One of the things that I’m worried about is the erosion of the distinction between words and deeds and how this opens the way to criminalize words,” he told me. One of the things that I was worried about was the relationship between Dolph Lundgren and his firearm. With all that bulk, just how fast a draw would he be? Rose is the subject of a death sentence, luridly renewed last year when al-Qaeda reissued a hit list in which Rose appeared alongside a crossed-out Stéphane Charbonnier, the editor of the French satirical magazine Charlie Hebdo who was murdered with 11 others at his offices in Paris on January 7, 2015. Rose’s worry is that by reclassifying words as deeds, the distinction between verbal insult and actual physical violence is collapsed, with devastating consequences for free speech. Words and images, he concedes, can be hurtful. But they are not agents of mass destruction. 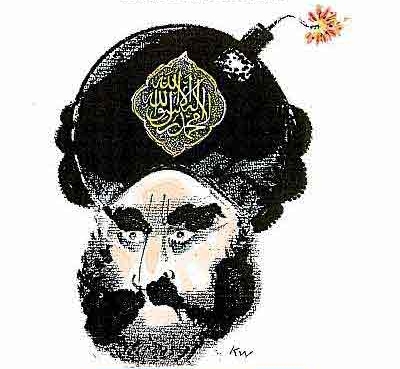 On September 30, 2005, Jyllands-Posten published 12 editorial cartoons under the title, “The Face of Muhammad,” the most notorious of which depicted the prophet with a bomb in his turban. Another showed the prophet in heaven, remonstrating suicide bombers with the words, “Stop, stop, we have run out of virgins!” Two weeks after the publication of the drawings, a delegation of ambassadors from Muslim countries petitioned the Danish government to condemn the cartoons and punish those responsible for them. The cartoons, the ambassadors insisted, were “demeaning” and abusive toward Islam and Muslims. They were also blasphemous in the eyes of many Muslims. The government responded by insisting that it had no right to interfere with the freedom of the press. This was still largely a Danish story, right up until the end of January 2006, at which point it began metastasizing into a global flashpoint—and people started getting killed. On February 4, 2006, the Danish and Norwegian embassies in Syria were set alight. A day later, a mob burned down the Danish embassy in Lebanon. In total, 139 people were killed amid demonstrations against the cartoons from Nigeria to Pakistan. One minister in the Indian state of Uttar Pradesh promised a reward of $1 million for anyone who beheaded one of the Danish cartoonists. On March 20, Amer Cheema, a Pakistani student, appeared in the lobby of the Die Welt newspaper offices in Berlin. When security guards refused to let him enter the building and see the paper’s editor, Roger Köppel, he pulled out a knife and was taken into custody, where he admitted that he had intended to kill Köppel for reprinting the cartoons. Later still, in January 2010, a Somali man wielding an axe and a knife made a failed attempt on the life of Kurt Westergaard, who had drawn the picture of Muhammad with a bomb in his turban; the assailant was unable to penetrate the panic room where Westergaard had sought refuge along with his five-year-old granddaughter. Did the cartoons really “provoke” this cataclysm of violence, spurring enraged Muslims to action, as so many commentators have suggested? Devoid of context, it certainly looks this way, but then devoid of context violence can pretty much look like anything you want it to look like. The context, at least as Rose explained it in a Washington Post article published at the height of the controversy, was a climate of “self-censorship in Europe caused by widening fears and feelings of intimidation in dealing with issues related to Islam.” “The idea wasn’t to provoke gratuitously,” he wrote, but rather “to push back self-imposed limits on expression that seemed to be closing in tighter.” Rose cited the case of a children’s-book author who had trouble finding an illustrator for a book on the Koran and the life of the prophet, such was the level of fear surrounding depictions of Muhammad. 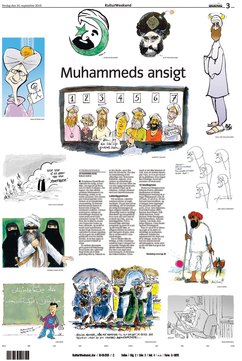 The context also included the dissemination of the cartoons across the Middle East by a group of Danish imams, whose aim was to “internationalize” the issue, “so that,” as Ahmad Abu Laban, then the leader of the Islamic Society in Denmark, expressed it, “the Danish government would realize that the cartoons were not only insulting to Muslims in Denmark but also to Muslims worldwide.” The Egyptian cleric Yusuf al-Qaradawi soon called for “an international day of anger for God and his prophet.” “We must rage, and show our rage to the world,” he thundered in a sermon that aired on Qatar TV. This was on February 3, 2006. The very next day, protesters torched the Danish and Norwegian embassies in Syria. Rose left the question hanging. But given the choices he’s made since the publication of the cartoons, his answer is plainly evident: You do not bow down. On the contrary, you confront the bullies and terrorists who want to silence you. You do not give in to fear. As the crisis unfolded, and the threats against Jyllands-Posten and Rose mounted, he could have gone into hiding. But he refused. He could have apologized and sought absolution from his persecutors, but he didn’t. And he could have retreated from public life. Instead, he became a dogged and vocal free-speech advocate. In October 2009, the FBI foiled a plot to assassinate Rose and Westergaard. One of the plotters, an American of Pakistani heritage, was linked to a terrorist attack in Mumbai the previous year and had visited Denmark twice on reconnaissance missions. The Charlie Hebdo massacre further heightened concerns over Rose’s security. Yet none of this seems to have left Rose unhinged. Writing about his friend Salman Rushdie—the British novelist who was subject to a fatwa calling for his death for writing a work of fiction—Martin Amis confessed, “If the Rushdie Affair were, for instance, the Amis Affair, then I would, by now, be a tearful and tranquilized three-hundred-pounder, with no eyelashes or nostril hairs, and covered in blotches and burns from various misadventures with the syringe and the crack pipe.” Rose shows no such signs of disarray. You wonder how he does it. In person, he is courteous and self-effacing. Some critics on the left have described Rose as a free-speech fundamentalist who does not appreciate the limits of free speech in a pluralist society and the responsibilities that come with its exercise. Rose objects to this portrayal. There are limits to free speech, he insists. But they must be narrowly defined: incitement to violence and defamation of character are the lines that, in his opinion, speech should not cross. He also repudiates any implied moral equivalence between himself and those who would slaughter innocents in the name of their beliefs. Yet he accepts that he is a fundamentalist of sorts, in that he believes free speech is a fundamental right and a central precondition for a democratic and free society. “I see that as a mark of honor, to be a free-speech fundamentalist,” he told me. He is also opposed absolutely to the idea, as the American legal philosopher Ronald Dworkin put it, that people have “a right not to be insulted or offended.” Offense, Rose argues, is the price of living in a free society. But in an age of “safe spaces” on university campuses, he is not especially sanguine about vanquishing that perceived right any time soon.